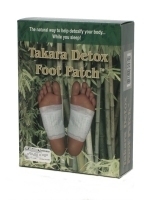 The Original Takara Takara Detox Foot Patch - Naturally works... while you sleep. With the original Takara Detox Foot Patch external cleansing pad. Absolutely! If you use a credible foot patch with the proper quality ingredients and the required potency and blended ratios... like found in the authentic Takara Detox Foot Patch. It is this specific nine ingredient natural formulation, and the precise blending ratios of these ingredients that make the Takara Detox Foot Patch formulation so popular in the marketplace. A cheap patch with an inferior ingredient blend might produce less than expected results. 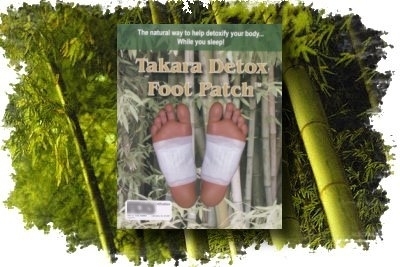 The Takara Detox Foot Patch is a powerful absorption pad. 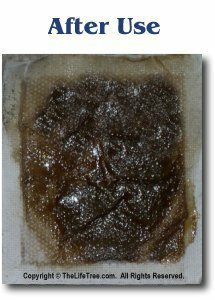 Independent analysis show that expelled fluids & substances can be effectively absorbed by the pad... safely and naturally! NO potentially harmful ingredients (eg. sorbitol, glycolic acid)! or unnatural ingredients (eg. Silica Dimethicone Silylate)! Absolutely NO foil packaging or metallic 'heat reflector' backings which can possibly degrade the ingredient potency, as well as negatively alter the absorption process. "Wow! The Takara Detox Foot Patch really works. I tried some of those other foot pads out there, but the results I got back when I used your Detox Foot Pad was unbelievable. I can't tell you how good I feel now. I would recommend to everyone who might read this to try these foot pads. None of those other imitator patches out there can compare to the original Takara Detox Foot Patch formulation!" "I'll confess that I tried some of those imitator patches out on the market. Not even close to the same results! The Takara Detox Foot Patch is by far the king of the foot pads." "I was pleasantly surprised by the Takara Detox Foot Patches. At first I was skeptical to try the the the Takara Detox Foot Patch because I've tried other brands, which were very expensive and I didn't get the same results. But what a difference in this patch! Thank you for selling a product that actually works!" "As a doctor, I am inclined to test how well an intervention performs. In the case of the Takara Detox Foot Patch, a single-subject design, with periods of use/disuse/use/disuse/use, has convinced me that the patch is indeed an incredible, highly-reliable, effective product." 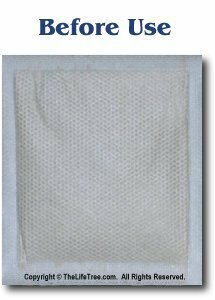 The authentic Takara Detox Foot Patch is a premiere 100% natural absorbing foot pad. The official Takara Detox Foot Patch recipe is by consumer report to be the #1 best-choice foot patch on the market; utilizing only superior purity and grade of ingredients possible - blended in the precise formula ratios for the absolute maximum absorption results. Click here for Takara Detox Foot Patch ingredient listing. Insist only on the quality ingredients found in the authentic Takara Detox Patch. After 26 years of research and development, it was discovered that a unique combination of bamboo vinegar, wood vinegar essence found in Oak, Beech and Sakura trees, and other essential natural ingredients have the unparalleled ability to absorb. The Takara Detox Foot Patch is based upon this unique concoction of bamboo vinegar, wood vinegar essence, and essential complimentary ingredients to form a truly powerful absorbing product. The invention of the foot pad has created much excitement in Japan, receiving high recommendations from many people. Japan�s leading health magazine, �An Xin�, has also featured articles based on its widespread usage by the Japanese populace. This original Asian study of the unique health, longevity, and natural disease resistance of particular mature trees deep in forests led to the beginning of the formulation of the ingredients for the foot patches. These special trees ability to not only purify large amounts of ground water through the roots into high quality water transported into the trunk and leaves, but the as the powerful absorbing ability of the wood sap made it a study-matter ingredient for human use. However these ingredients were only the beginning for what would after years of study and research would later become the basis for amazing Takara Detox Foot Patch. Potent, high-quality, all-natural ingredients in the Takara Detox Foot Patch include the powerful combination of bamboo sap, wood sap, and ionic tourmaline minerals. The patches also contain Agaricus mushroom, chitosan, eucalyptus sap, saururus chenesis, and cornstarch to complete the proprietary formulation. In the end, the combination of these robust ingredients in the precise herbal ratios became the Takara Detox Foot Patch standard that would take the world by storm! Many customers elect to have their used pads analysed to validate the results for themselves, to help verify what specific components may have been absorbed by these amazing external foot pads! The patches are adhered like a big bandage to the soles of the feet overnight. Although it is not a requirement to use them every night, a consistant regiment may help speed up the overall cleansing experience time-frame. The total length of time required can vary dramatically from person to person, depending upon the individual. Although, after repeated usage over a period of time, the absorption results on the pads usually become noticeable. The foot pad phenomenon is growing in popularity throughout the region. The worldwide popularity and use of the Takara Detox Foot Patch is growing at a phenomenal rate, with even more international widespread usage as the amazing properties of this unique and effortless absorbing foot patch becomes readily known throughout the industry. Takara Detox Foot Patches work best when placed on the soles of the feet, but they can additionally be placed on many other targeted areas of the body. Note: The Takara Detox Foot Patch should not be placed over open wounds, irritated skin, mucous membranes, or around the eye area. The Takara Detox Foot Patch can also be very effectively placed over other areas of the body. When using on any area where the skin is naturally moist, oily, curvy or prone to motion; it will help to use some form of adhesive tape or similar product (like band-aids or medical tape) to better ensure optimal contact of the foot pads with the skin. 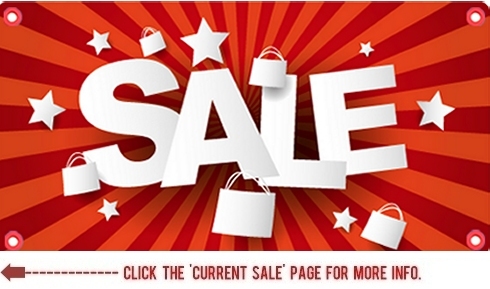 100% natural, consumer-favorite foot pad in the marketplace! 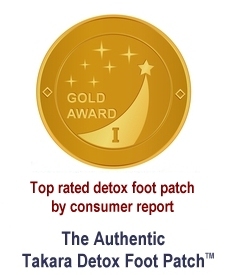 World-renown and trusted, you owe it to yourself to accept no imitators... insist only on the authentic Takara Detox Foot Patch! Click to add Takara Detox Patch to cart! Skeptical that the patches really work? Try the pads yourself for 1 night FREE! Limit 1 free pack per household customer. + $4.35 Flat-Rate Worldwide Anywhere Shipping.